The Collecting of Teddy Bears is a wonderful hobby, enjoy it. Trust your own judgement and collect only Teddy Bears and themes which you like really. Become as knowledgeable as you can. Read books, magazines about collecting and Teddy Bear magazines. Collect the catalogues of manufacturers Good catalogues include plenty of information about the respective Teddy Bears. Buy video films about Teddy Bears. Read the company newsletters of the individual manufacturers. Visit periodically the Internet websites of the manufacturers. Information about the HERMANN Coburg Teddy Bears you will find under www.hermann.de in the Internet. Don’t buy all at one time. Collecting means, to built up your collection step by step. Only then you can extensively occupy yourself with each new entry. Document your collection. 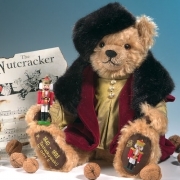 You will find a form to register your private Teddy Bear Collection in this collector’s guide. When ever you have the chance, get your special bears signed by the manufacturer on the Bear’s paw or on the certificate. Attend to the declarations on the adjoined certificates. For all the names of the Bear have to be noted, otherwise a authentication of Bear to the certificate is not guaranteed. With regard to a quantitative limitation, pay attention to the individual number of the Bear is noted on the Bear itself and not only on the certificate. Look for a retailer of your confidence, who will inform you periodically about the publishing of new Teddy Bears. a year its showing room and its manufacture for one week for public visitos. Information about this event you will get directly from HERMANN Coburg or at the HERMANN Coburg website at www.hermann.de in the internet. Attend when the manufacturer starts with a new theme series. The experience shows, that the first Bear of a series will be especially requested in future. Attend to “end of edition” Bears. The experience shows, that these Bears are only hard to get in retrospect. Attend to the introduction of new Teddy Bears. Shortly after a new introduction you have the best chance to get one of the first Bears of the edition – perhaps with a ow limited edition number. The experience shows, that these Bears are especially requested. Attend to Award Nominees and Award Winners. Attend to “first ever made” Bears. The experience shows, that these Teddy Bears are especially requested. Attend to small limited editions. The experience shows, that low limited Bears are normally very quickly sold out. Attend to first issues, special editions, country editions or customized editions, which are normally published only in small quantities and which are very quickly sold out.